At the International Flower Essence Repertoire, we specialise in flower and other vibrational essences. Its the subject we know best, and generally speaking we like to stay with our chosen area of expertise. But when our Director Don Dennis came across the Australian probiotic Prime Directive in 2003, he was astonished by its potency, by its dramatic ability to help one's digestive system. Since our intestinal health is so fundamental to the whole of our health, we decided to have IFER offer Prime Directive to our customers, alongside our flower essences. We truly believe it is an exceptional product. Prime Directive is packed in a plastic tub as a loose powder of 22 organic wholefoods, 18 amino acids, and 13 different strains of beneficial lactobacillus bacteria. It takes 5 weeks of a special process of fermentation (FloraFerm™) to produce each batch of Prime Directive, so all of the 22 wholefoods have been pre-digested before the Prime Directive is packed into the tubs for market. 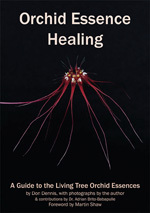 The genesis of Prime Directive, and the core of its effectiveness, came about some 20 years ago when a baker in Australia began collecting different strains of lactobacilli, and then submitting them each to various stress challenges over the years: excess heat, excess cold, antibiotics, various chemicals, etc. Those portions of each strain to survive the challenges was the portion that then was grown for the future product. Over many years a dozen very robust strains were developed in this way. And as a result, they are able to help transform the quality of one's intestinal flora. 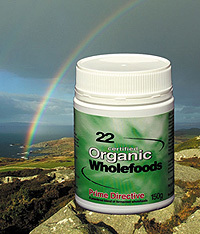 Each of the organic whole foods in Prime Directive have been carefully grown and individually selected for its powerhouse of nutrients. Nature’s wisdom provides naturally-occurring vitamins, minerals, amino acids, essential fatty acids, enzymes, anti-oxidants and many other nutrients in these foods. Through the FloraFerm™ process these whole foods are broken down (pre-digested) by friendly bacteria releasing the nutrients for easier absorption and assimilation. This means you are getting pre-released nutrients, reducing the burden on the digestive tract. Prime Directive does not contain a single manmade vitamin, synthetic mineral, chemical filler, binder or extract. It is exactly as nature intended – pure, organic and natural. Organically grown Spirulina, Whole Organic Grains (Oats, Wheat, Barley, Flaxseed), Adzuki Beans, Black Strap Molasses, Organic Grasses (Green Barley, Green Alfalfa, Green Wheat), Whole Organic Sunflower Kernals, Whole Pecan Nuts, Whole Almonds, Whole Pepitas, Organic Brown Rice, Organic Whole Rye, Organic Whole Maize, Organic Mung Beans, Organic Whole Millet, Organic Whole Alfalfa Seed, Organic Whole Buckwheat, Organic Fresh Ginger. 13 strains of lactobacillus bacteria: lactobacillus acidophillus, delbruecki, caseii, bulgaricus, causasicus, fermenti, plantarum, brevis, helveticus, leichmanni, lactis, sporogen and bifidus. Recommended usage: Up to 1 teaspoon per day. But we suggest starting with just one-quarter of a teaspoon per day for the first two weeks, and gradually increase thereafter, up to one teaspoon a day.